I tried to resist you and your chic, minimalist packaging but I couldn't. Not to mention you're pronounced "Glossy-yay," which at first I hated, but now, kind of love. Who have I become? 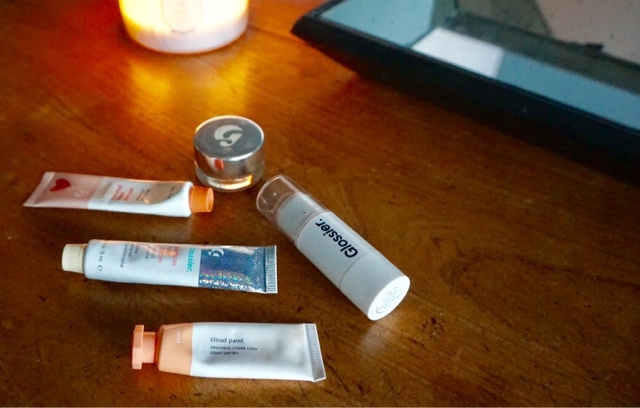 Okay, I've snapped out of my poetic banter, but let's talk Glossier for real. Lately, my love for this brand has skyrocketed. A while ago I placed my first Glossier order and have since placed quite a few. Not going to lie, I hit a miss with their Generation G when it had no color pay off, was drying and smelled like play-dough. I also wasn't thrilled when the Milky Jelly Cleanser gave me milky giant whiteheads (Too much? But it's true...) but every other purchase since then has been a home run. I promise, only positive vibes from here on out! 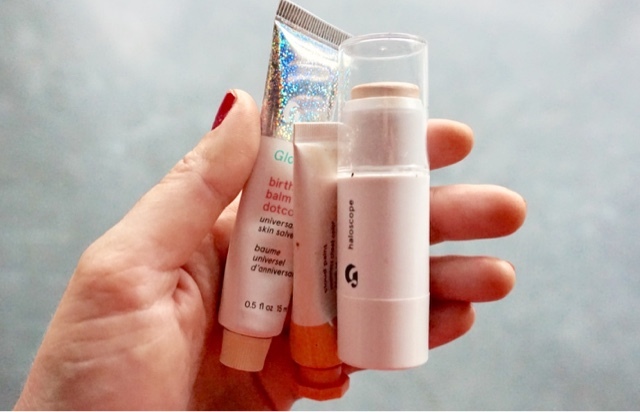 Let's talk Balm Dot Com. I love the coconut one for slathering on my lips and all over my body (i.e. cuticles, elbows), but I obviously could not resist the new Milk Bar Bakery inspired Birthday Cake Flavor. I have been putting that delicious vanilla-scented balm with micro-shimmer on my lips all day since it arrived! I've been dying over Haloscope in Quartz. It's the most subtle highlighter ever and looks like you are just naturally glowing where you place it. Some people don't love how subtle it is, but I love being extra and wearing highlighter every day, so I can get away with wearing this one to work without looking like a glitter bomb. Cloud Paint is literal heaven on earth. It's a gorgeous liquid blush that blends seamlessly and just looks so natural. 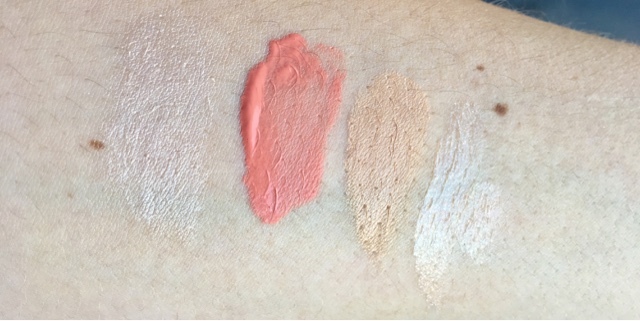 The color also lasts forever, which never happens for me with cream or liquid products.I have the color beam, because orangey blushes are really flattering and brightening on my skin tone, but don't think I haven't been eyeballing Dusk... Because I have. Also, as a concealer junkie, their Stretch Concealer is incredible. Definitely stay away if you have oily skin, but if you have dry skin and love to only wear concealer on casual days, this one is for you. I especially love this around my nose if I have a cold or allergy troubles, because it gives great coverage and is really hydrating on dry skin. So there you go, my Glossier rant has come to end. Not sure I will ever pick up any of their skincare items in the near future (still scarred from Milky Jelly) but I get on their site weekly to lust over Boy Brow, Dusk Cloud Paint, shoot, I've even looked at their sweatshirt. I know... so extra, so... Millenial. Anyway, have you tried anything from Glossier that you can tell me about to feed my addiction? If so, let me know! Oh no! I know they are coming to the UK soon, so hopefully Italy is not far behind. 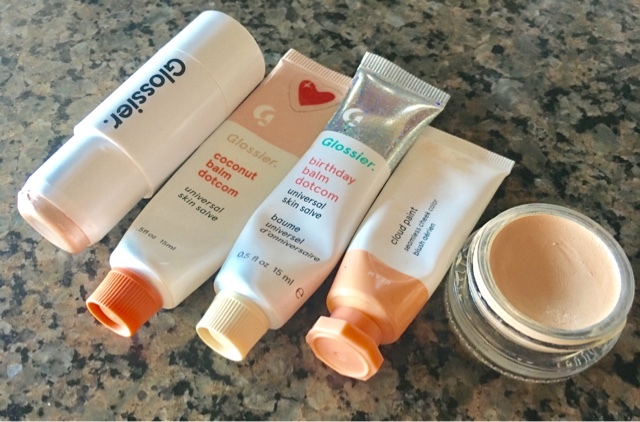 I have heard so many good reviews on glossier, and need to check it out. It's so good, especially if you are a fan of no-makeup makeup!